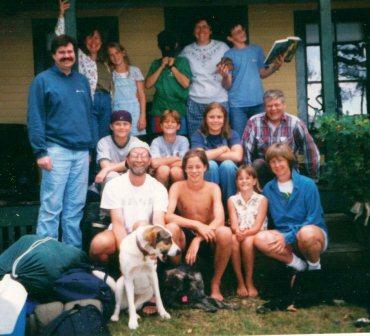 This is three families at a cottage off the coast of Maine. My family is in the front two rows. Our friend Bruce is on the second row in the plaid shirt and Colin is wearing the baseball cap. There’s so much to know to be a good mother that young moms can’t know it all. They can learn it from their kids and from other moms. Here’s ten things I wish I knew, or I discovered along the way. 1. Time is short, even though it feels long when they’re young. Cherish their childhood. It will be gone faster than you can believe. I know everyone says this and the days are long. Go the extra mile even when it’s hard. 2. Motherhood means sacrifice. You will eventually have more time for you. See #1. Learn to give as much as humanly possible. They’ll always want more anyways! 3. Take care of yourself. It took me a few years to learn this one. Self-care makes you a better mother. Spend some time and money on YOU. Then you have more to give. 4. Don’t fool with regret and guilt. Do your best. There is no perfect mother out there. As long as you get it right at least half the time, you’re good. Get help! See #5. 5. Other mothers and experienced mothers can help. Parenting support groups saved me and showed me how to have a respectful and healthy relationship with my kids, without yelling, threatening, spanking, bribing and punishment. It was an investment of time and effort that paid off. 6. HAVE FUN. Your kids will cherish the good times and hopefully forgive and forget the not-so-good. Kids thrive on fun. Laugh, play games, tell stories, play Charades together. 7. Kids don’t have to have it all. Learn to say “no” in a kind and firm way. Encourage them to earn money to buy more stuff. Show them how to have fun without spending a dime. 8. Kids are wonderful teachers. They are patient and kind. They will reflect back who and what we are. Sometimes the reflection is painful. They are flexible and can learn from us, especially through our actions. My kids let me make the same mistake over and over again until I figured out a different way. 9. Having family meetings and having kids do chores and family dinners are like putting money in the bank, an investment in everything you want your kids to become in the future. 10. Don’t sweat the small stuff. When my two young sons discovered a mud bath and got really dirty, my choice was to reprimand them or surrender and get out the camera, quickly, and laugh. As the young mother of three children born in 3.5 years, I thought “discipline” meant “punishment.” Through parenting workshops, I learned that “discipline” means “to teach.” Parents are teaching every minute of every day by our example, and how we manage others. To manage people means to get other people to do what we want. My question to you today is How do you manage your children? Do you yell, spank, praise, reward and punish? Or, are you their friend and set few limits? Children feel unsafe in both extremes. The greatest challenge for parents is to manage our emotions because children try our patience. When they don’t do what we want, when they make bad decisions and put their safety at risk, we feel anxious, worried and frustrated that they don’t listen to us. Therefore we are justified in punishing them. The problem with punishment is that it often breeds resentment, rebellion and revenge, and ironically, NOT the behavior change we wish to see. Tots to teens need limits set with respect, love and logic. Children need to experience the results of their decisions. My favorite line is “Give them enough rope to burn but not enough to hang” so they can learn to choose well and find out life’s rules. Here are some examples of how tots to teens can learn from their decisions. d. A 7-year-old forgets her mittens on a cold day and her hands get chapped. e. A 12-year-old chooses not to pick up his room. It becomes difficult to walk in the room and it l from dirty clothes. He has trouble finding clean clothes to wear to school and doesn’t care. In the first three examples, can you see how the parent explains the logic behind the decisions and in the last two, the parent can allow the youngsters to experience the results of their choices without intervening. The first three are “logical consequences” because they require parental action. The last two are “natural consequences” because the outcome happens without parental action. These are the most powerful and respectful ways for children to mature that sustain a positive parent-child connection. 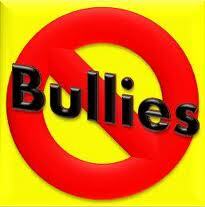 Here are some bullying responses to the same scenarios, that teach children those who are bigger, meaner, verbally or physically abusive, louder and stronger will win. Verbal abuse can be as devastating as physical abuse. In the last two, parents can allow youngsters to live with the consequences of their decisions. This shows mutual respect. Parents model problem solving and behavior management without punishment, reward and praise. Parents can teach children to choose wisely by being kind and firm, saying as little as possible and using natural and logical consequences that are related, reasonable and respectful (thanks to Jane Nelsen for the Three Rs of natural and logical consequences). The following came from Tracy Harrison’s e-newsletter on wellness As you can see, Tracy takes a positive approach to healthy eating. To her sage words, I add: have patience with your kids and teens in the next few days. Remember you’re their greatest teacher, your greatest tool is your example. Set kind, firm and fair boundaries that relate to the present moment and you’ll all feel better, with no need to yell and apologize later. Manage your emotions for a harmonious holiday. This holiday season, I invite you to explore the lost art of savoring. Actually seeing and then relishing the things in your life that you appreciate. Whether it’s a particularly delicious bowl of soup. Or a hug and a charming smile from a little one. The kind nature of a coworker. Some spectacularly comfortable pajamas. The stranger who lets you know your car headlights aren’t on yet. An energizing hot shower on a cold morning. The reassuring touch of a friend who truly hears your story. The fact that your car cranks on the first turn – every time. A warm cat who snuggles in your lap. We have so much to be grateful for – to savor, to celebrate. Use this time of Thanksgiving to actually SEE in your life the things you usually zoom through and take for granted. Pause. Smile. Allow gratitude to well up in you. Send that Thank You card you’ve been meaning to put in the mail for months. Slow down and truly savor your Thanksgiving feast, like it’s your last meal. Hug your spouse like it’s the last time you can. Live on purpose. Make your moments matter. Thanks Tracy. Subscribe to her newsletter here: http://www.eatonpurpose.com/. Sibling rivalry? Let it rip. There are a lot of relationships in this group. 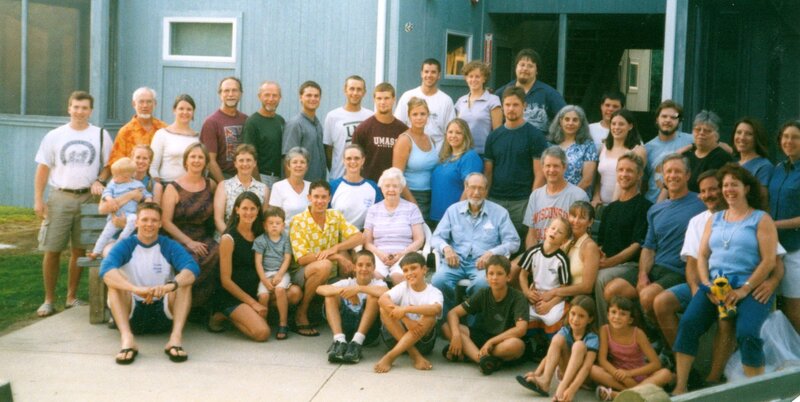 My parents are in the middle, surrounded by their eight surviving children and their spouses and children. More children equals more rivalry. I'm in the maroon dress seated, second from the left. If you have more than one child, sibling rivalry is usually one of your biggest challenges, and the best way for kids to learn to get along with people in the world. Disagreements, jealousy and wrongs are committed among people all the time. The question is, how to resolve them? An adult friend who is an only child said she hated fighting with her friends “because they always had the option of going home. If you have siblings, they can’t go anywhere. You have to work it out eventually,” she said. Your kids’ relationship will provide the foundation for the most difficult and rewarding relationships of their lives. Sound familiar? Getting along with siblings is preparation for marriage and work. The more parents take sides and punish for sibling rivalry, the worse it will become because the kids will use it as a way to manipulate parents. They’re still learning from that, too! Here are some techniques to encourage them to get along. 3. Take all fights outside or to basement –because audiences make fighting better. Cold weather makes short fights. 4. Make sure your kids are getting sufficient attention from you at neutral times so they’re not using sibling rivalry to get negative attention. 5. Don’t feel sorry for younger and weaker siblings. They have excellent defense and offense tactics. They can also learn the valuable lesson that annoying bigger and older people can result in pain. 6. Use a confident voice and body language when saying, “You can do it. I know you can work it out.” Then walk away. 8. Some problems never go away until childhood goes away. This is life & parenthood. They will grow up and leave home. When you allow them to work it out, they grow closer. Comments: Comments Off on Sibling rivalry? Let it rip. 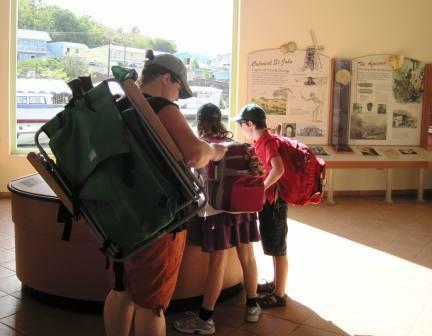 These kids on vacation carry their own backpacks -- hopefully with lunch inside. An upcoming vacation or holiday are excellent opportunities to teach kids how to save money. While watching the Patriots yesterday, I took note of commercials because I rarely watch TV. “Aunt Sue, how do you know what to buy unless you watch TV?” my nephew asked dryly. I don’t need to buy much. I might want to buy more than I need. Managing my emotions around my wants has been critical to money peace. Spending less than you earn is a valuable life lesson that parents can teach kids from age five on. Five year olds can learn to manage small amounts of money through a weekly allowance not tied to chores. Give her 50 cents and allow her to lose it, give it away, save it or spend it on whatever she wants. Introduce the idea of saving for a special occasion, such as an excursion, day trip or holiday. When she gets in first grade, increase the allowance so she can choose whether to buy lunch a few days a week or make a brown bag lunch and save money. Put “allowance” on the family meeting agenda. Kids as young as 3 years old can participate in a 10 minute family meeting that includes compliments, new business, a snack and family fun. See my tip sheet on family meetings. Talk about how they can budget their allowance, plan, donate and save for special occasions. Don’t do it for them. Allow them to experience spending all of their money and your kind firm refusal to be a money machine. Unless you want to undermine their money management by showing them that you’ll always bail them out of financial problems, and they should be able to buy everything they want. Award allowances without tying them to chores because they contribute to the family welfare, they also share in the benefits. If you bribe them , you’re teaching them to manipulate people with money, and to work for money. According to research, money is the LOWEST form of motivation. Have you ever worked only for the money or had an employee only in it for the money? Both are bankrupt. It takes time to learn to manage money and develop internal motivation to contribute to a family and society. Allowances teach children to manage small amounts of money with guidance, and to patronize yard sales. By the time children are old enough to “want” things, they are old enough to earn money outside of the family by pet care, yard work, mother’s helper, lemonade stands and more creative ideas. I discourage the practice of paying kids to do special chores to earn money for special purchases. My husband bought his third new car ever on Friday. The first new car was in 1981, the second — a work truck — was bought in 2005. Bob drove used cars while we paid for food and housing, shoes, braces, school trips, fun things, teen beater cars, and college education for our four children. At the end of the day, it’s nice to have a new car that we could have lived without. One of the things I appreciate about him the most is his healthy and generous relationship to money. You can nurture this in your children by your example, encouraging them to live within their means, and setting kind and firm limits. Ryan G. Van Cleave Ph.D. describes his journey to hell and back over addicting games. My biggest fear for our 4 children (now 23-30) was addiction — like drugs, alcohol, anorexia, bulimia, gambling, and video games. 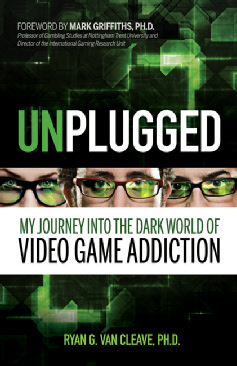 I just read, “Unplugged: My Journey into the Dark World of Video Game addiction” by Ryan G. Van Cleave Ph. D. Wow. Powerful. I love first-person stories told with disarming honesty. That’s powerful self-disclosure about the destruction of the havoc World of Warcraft wreaked on his life. Most video game consumers are like Ryan — 20- or 30-something. He says little about how video games can desensitize humans to violence. Ryan’s focus is addiction and the difficulty of kicking the virtual habit. I love to give books like this to tweens and teens so they can read a compelling true first-person account of addiction. “A Million Little Pieces” By James Frey, true or not, offers the same first-person horror that I hope instills fear and good decision. Warning: Ryan describes sexual exploits so preview the book. It might be too much for middle-schoolers. My 60/60 parenting theory goes like this. Invest the first 12 years in loving them unconditionally, having family meetings to set reasonable boundaries together that are enforced by firm, friendly and consistent parents, avoid reward and punishment, capitalize on the trio of family dinner, family chores and family meetings, and use natural and logical consequences that are related, respectful and reasonable. This style of “discipline” will make a difference in your family life. Children learn mutual respect, responsibility, self-discipline, self-esteem and how to make good decisions. S/he will use that good decision-making ability to choose well as teenagers when they’re 60 miles away, going 60 miles an hour, most likely in your car. That day is inevitable unless your child escapes to Mars from age 13 to 19. The goal is to get them to choose wisely when you’re not around. This requires a positive relationship based on mutual respect. Plant those seeds from birth to 12. For the gamers, have a family meeting to negotiate a reasonable amount of screen time per day and how to monitor it. Remove screens from bedrooms. Kids need adults for guidance. Enforce agreements in a kind, firm and consistent manner. When kids are involved in setting limits they are more likely to abide by them. Use video game time judiciously as video gaming has replaced TV as the preferred in-home babysitter. Teach them the valuable life skill of moderation so they don’t end up addicted to World of Warcraft like Ryan Van Cleeve.